Genius. Who doesn’t want to be a genius? I want to be one. That’s what drew me in when I first saw this pre workout on Amazon. I saw that they have some really interesting ingredients, and surprisingly, NO caffeine. How could that be? How could it be that this product contains no caffeine and sell ANY product in the pre workout category? It didn’t seem to make sense. So I bought a tub to try and see how Genius pre workout works for myself. Why don’t we start by reviewing the taste. Does Genius Pre Workout Taste Good? This is a really good question. One that I’m not sure you will agree with me on, since taste is so subjective. But as you know from my other reviews, I’ve never much cared for voicing the popular opinion. Lol. So. Here’s the thing. I love the originality of this formulation. Grape Limeade is a very creative flavor concept that I’m not sure I’ve EVER seen in a pre workout. But. Did Genius pull it off? I’m afraid that they might not have. The flavor is sweet and pretty authentic to start off, but it, well, sort of fades into a generic sort of citrusy ‘average’ supplement taste. I wish it had more depth; I guess is what I’m trying to say. But it’s definitely drinkable. I think I’ll give it an 8.2 out of 10. It is good, but it’s not great. I think it’s because it does not use artificial sweeteners. It uses just stevia as a sweetener. Stevia, to me, is gross. So Genius pre workout is actually done well to get over a B rating with just stevia as the sweetener. That’s a pretty good thing. Let’s talk about if this pre workout actually works now. Does Genius Pre Workout Really Work? Genius pre workout DOES work…don’t get me wrong. It provides a super unique sense of heightened focus and mental energy, which can be, well, a little ‘jarring’ if you aren’t used to nootropics, which are a class of supplement ingredients that impact the way you think. 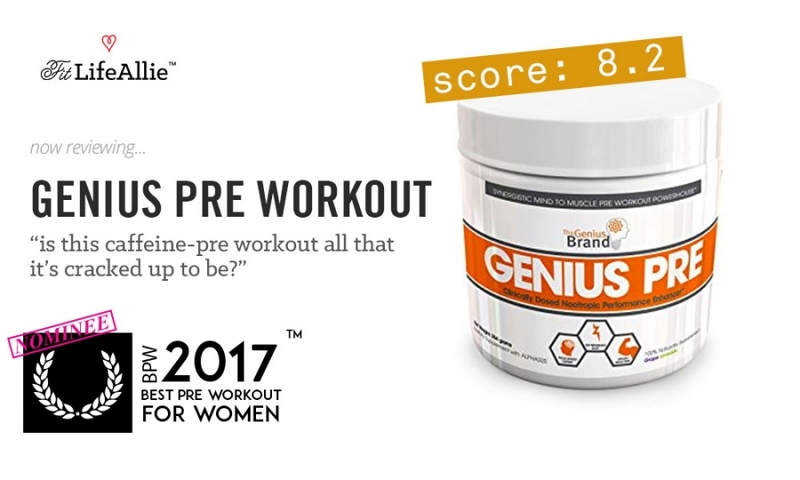 I sometimes shy away from these types of products because they can invoke and trigger anxiety, but, so far I haven’t really experienced that with Genius pre workout. That might be because it doesn’t include ANY caffeine- which is found in almost every other pre workout in the world. I’ve used Genius pre workout six times now, and with fairly consistent results. I find myself using it for the days when my rep range is highest, meaning I can reap the benefits of the ‘mental endurance’ if that makes sense. I think my best workout on it was a high-volume leg day, where I was completing like 8 sets of 10 reps per exercise. Yeah. Super high volume. But Genius pre workout did seem to help, especially late in the workout when I needed it’s help the most. In some regards, I think inexperienced pre workout users should actually start with a different pre workout than Genius. It sounds crazy but you’re actually going to ‘feel’ this Genius pre workout way more than other, more traditional pre workouts, and certainly some of the more mild ones like Ora Renewable Energy or those lousy Revere pre workouts that I recently reviewed. So. My verdict on the Genius pre workout from a performance standpoint is that it’s a pretty legit performer from an energy standpoint, also crossing over into endurance. I think the product does lack in the strength department since it is mostly a mental booster, but I think that fact that it is more focused on the one aspect makes it attractive because not everyone needs a complete pre workout. Let’s actually take a minute now to look at the ingredients and discuss what’s in this Genius pre workout. What’s in Genius Pre Workout? There are a handful of very serious nootropic ingredients in this pre workout. Many of them you’ve seen before in other pre workouts, but I don’t think I’ve ever seen this exact combination before in many pre workouts. I’ll list the ingredients in the Genius Pre Workout and then go into my notes on this formula. And once again, how strange it is to see a pre workout with all these familiar faces like betaine, beta alanine, citrulline malate, but then no caffeine. It’s so bizarre! But one of the things that I told you guys is that this Genius pre workout still packs a HECK of a punch without caffeine. And that is because of two things- first is the huperzine. It is the smallest quantity ingredient in here but also the strongest. This nootropic is like, a little bit ‘iffy’ when you think about it’s potency and relative lack of testing around it. But that’s nothing new to the supplement industry. Look. Most of these pre workouts still use DMHA and AMP Citrate and all those intimidating and dangerous characters. No thank you! But Genius is walking the fine line, most likely on the okay side, with huperzine. Now. Other big time nootropics are the ALPHASize Alpha GPC, and theobromine. It’s this balance of ingredients that help your brain focus and fire properly that make Genius feel quite different than some of the other pre workouts on the market. It’s a very interesting product indeed. Anyways. That’s Genius pre workout from the inside. Let’s talk about the outside now to wrap up our Genius pre workout review. It’s time for our packaging review. Genius Pre Workout Looks Average. Okay this pre workout is very intense on the inside but the outside is just, well, a little bit pedestrian in my opinion. The colors, the graphics, it’s all just rather plain in my opinion. Now. I know the appearance isn’t all that important to most of you guys so I can accept that the pre workout performance is much more essential than the looks. But I still think they could’ve gone in such a better direction with this pre workout in terms of the packaging. Don’t you think so? I mean. The white and orange is just rather plain. You know what I mean? Just plain jane. Nothing genius about it. There’s hardly even anything to discuss it’s like just the orange strip running horizontally across the thing and then the big product name, a few simple graphics, and that’s it. Boring. Alrighty let’s wrap this review up, shall we?